Did you know that the monsoon season in southern Arizona is from June 15 to September 15? A typical monsoon will start with winds that kick up late in the afternoon and the rumble of thunder in the distance. As the storm blows in the winds increase and there is thunder, lightning and downpours. The storms are intense and rainfall spotty falling in different areas at different rates. Speaking of monsoons and lightning, hear is a little fact; the Tucson Arizona area averages 600,000 lightning strikes per year! Imagine what a grand display that is! 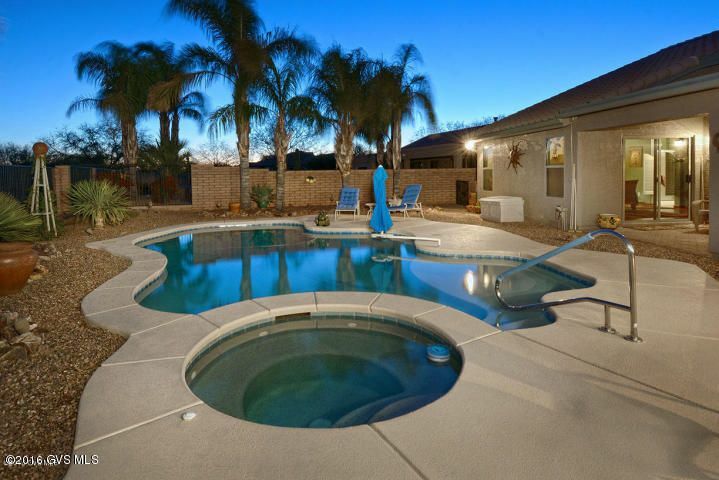 This Quail Creek home truly has it all, a golf course view desert view and even a pool and spa. Its reasonable price considering the amenities and location make this a no brainer for our pick of the week. For complete details on this Quail Creek stunner or to schedule a showing click here or call us today at (520) 477-9090. Please read this website in its entirety to fully understand the sale of the subject property. This is a Fannie Mae HECM (Home Equity Conversion Mortgage) reverse mortgage foreclosure, which must be sold subject to 24 CFR 206.125. (This means there are very specific guidelines outlined for the sale of this property, which are outlined below. You can read further HERE.) Even though this is a Fannie Mae product, it has its own set of unique guidelines that are NOT the same as typical Fannie Mae guidelines. The seller has special rules to follow in selling this property in order to qualify for their mortgage insurance reimbursement for their foreclosure loss. The subject property CANNOT be sold for less than the current appraised value as established by an FHA Roster Appraiser (list price), without HUD’s express authorization. Offers submitted below list price cannot be accepted and at the seller's discretion may not be formally countered regardless of any terms, conditions or circumstances. Property is sold "AS-IS AT TIME OF SALE". In many of these properties, they will not be completely cleaned out and they will not be maintained during the escrow process. Buyer accepts condition at the time of closing. There can be no repairs and no termite completed on property. This includes repairs or termite completed by the buyer. If buyer is found to have completed any repairs or termite during contract period without written authorization from seller, contract will be terminated immediately and buyer will not receive any reimbursement. If repairs will be required for buyer's financing, do not offer as they will not be completed. Per HUD guidelines, utilities will NOT be turned on at any time at seller's expense. Buyers AGENT may turn on utilities and Buyer will be responsible for any and all costs incurred turning on the utilities. Utilities can ONLY be turned on during 10 day inspection period and utilities MUST be turned off upon completion of inspections or 10 day period. Homepath Financing is not available. This property does not qualify for any special financing from the REO seller. Seller does not provide HOA documents. Buyer will be responsible for incurring the cost of all governing documents. Seller does not allow buyer to pay a transaction coordinator fee, additional selling agent commission or any other transaction related expenses to the selling (buyer's) agent. If fees are on the HUD, the HUD will be rejected by HUD and property cannot close escrow. The published CBB in the MLS is the only compensation allowed to the selling agent. Other costs not allowed by HUD at closing include, repair reimbursements or allowances, county and or city transfer taxes, home warranty fees, discount points or closing cost credits, wire fees, "miscellaneous" fees, courier fees. Fannie Mae does not allow for a 1031 exchange. If a corporation/LLC/LP is purchasing the property, the Articles of Incorporation/Organization will be required as well as Specific Signing Authority. Mediation and Arbitration will be removed from the contract. Seller requires 30 days for a cash transaction and 60 for a financed transaction. This gives time to ensure a clear title at closing. Property may be able to close sooner and extensions to this timeframe may be required. Under no circumstances is the buyer allowed to move into the property (including personal property) prior to the close of escrow. There can be NO exceptions to this and prior possession is grounds for termination and forfeit of deposit. Green Valley Recreation (GVR) voted Thursday to rescind 2016 rate hikes and policy changes. 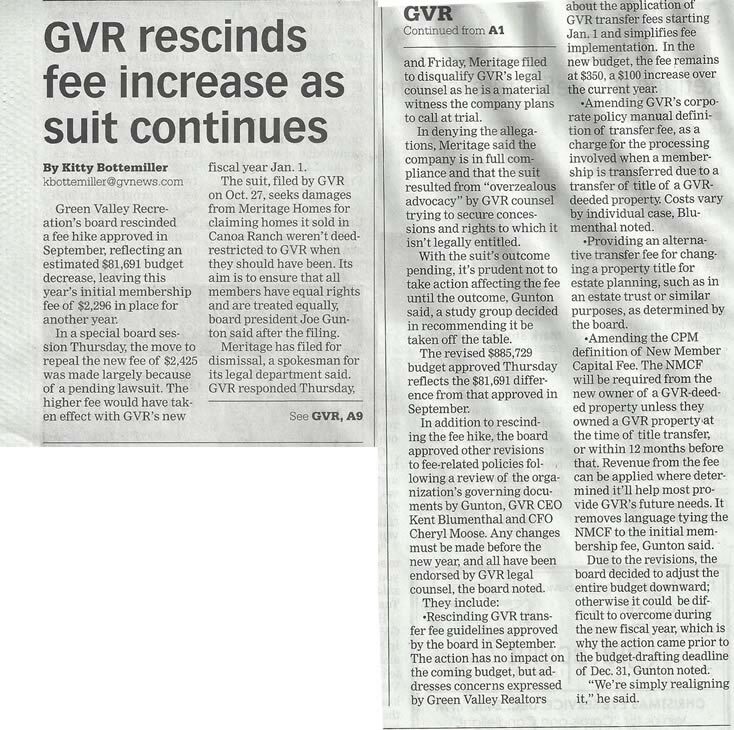 The GVR board of directors had previously approved 2016 rate hikes for the New Member Capital Fee, Yearly Fee, and Transfer Fee. Additionally GVR reversed their decision to close a self described 'loop hole' for investors. GVR board president Joe Gunton cited a pending lawsuit with Meritage Homes as the reason for the boards reversal. Though the lawsuit is seemingly unaffected and unrelated to rate changes. The 2016 rate and policy changes were a source of controversy amongst the GVR membership and the Green Valley Sahuarita Association of Realtors (GVSAR). Recently GVR CEO Kent Blumenthal, CFO Cheryl Moose and the GVSAR met to discuss the previously approved changes. Realtors expressed concern and frustration on several points. The primary points being the lack of transparency and omission of rate hikes during a recent boundary expansion, a dramatic increase in fees to investors or those purchasing a second home, and a new policy which would have forced sellers of a home in GVR to pay a second fee of $2,425 and later seek a refund when buying a new primary residence.